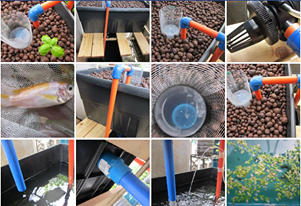 Amazed by aquaponics systems shared in the internet from all over the world, like Hawaii, Australia, Canada, Texas, Colorado, Florida, Greece, Trinidad and Tobago, Japan, Malaysia, Taiwan, Puerto Rico, Kingdom of Saudi Arabia, Uganda and many more, we (Aquaponics PH enthusiasts) have been in search for success stories particularly in the Philippines that would spark inspiration among those who are contemplating on making big in Philippine aquaponics. 1. 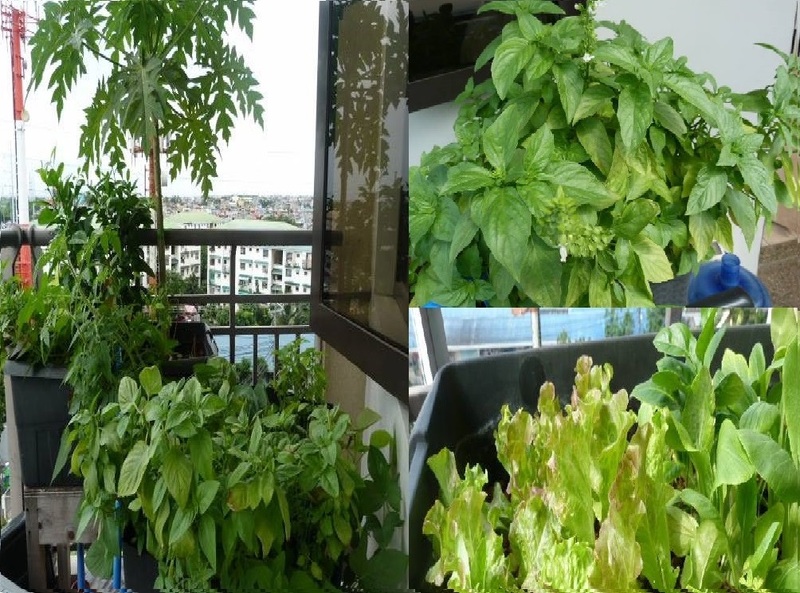 Aquaponics in a condo veranda in Taguig. This is where test planting is done for various vegetables and herbs and the favorite plant of all – Basil. Why favorite? It repels plant pests like ants and aphids. Under a balanced system, test result shows that a one feet by two feet growbed will approximately provide your family 600+ grams of basil harvest every 15 days. And what’s amazing is that after cutting one stem, another two sprouts from the cut stem after three days. 2. Aquaponics in an unused car garage in Cavite. 600L fish tank with four growbeds in cycling stage. It’s another test setup for data gathering. Since the garage roof is covered with thick green polycarbonate, the sunlight can’t fully pass thru to aid in plant’s photosynthesis. Plants are leggy in appearance showing sunlight deficiency. 3. Aquaponics in Bulakan, Bulacan. Newly setup system owned by Arnold and Anna Liza Salvador. The original idea was to produce tilanggit (tilapia processed like danggit), but when the couple found out about aquaponics, they thought of setting up a better and sustainable system in their backyard. Hence a semi-commercial aquaponics system that will provide fresh fish and vegetable for their locality was born. 4. 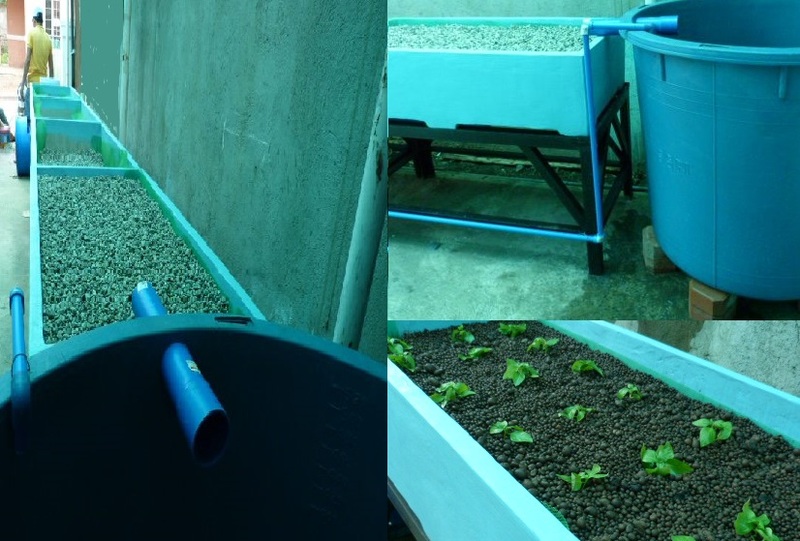 Aquaponics in Alabang by Bahay Kubo Organics team – Enzo, Ryan and Illian. This is an entry to Project Pagsulong in 2012 which we shared in our previous post here. We have been revisiting this site and plants are growing better as the system matures. 5. Aquaponics in Laguna by Akim Vergara of Bay Aquaponics. Another aquaponics enthusiast turned entrepreneur who lives and breathes aquaponics. 6. 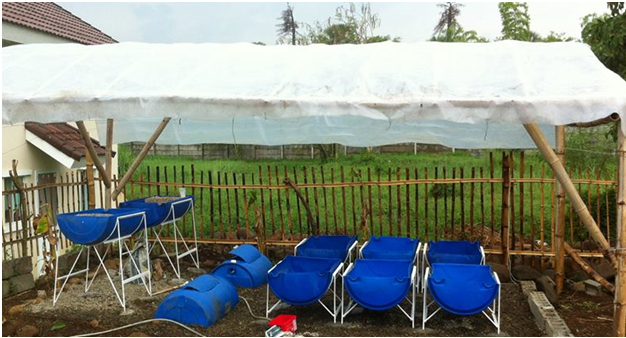 Aquaponics in Lucena by Philippine Aquaponics Club team – Carlo, Lance and Gab. This is just one simple and neat system among many others they have already built. The group also came out with new designs which you can view from their FB page. 7. 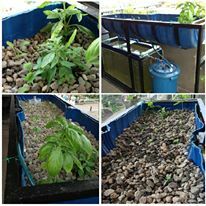 Aquaponics from an orphanage in Alabang. The system produces organic fish and vegetables for the nine hundred plus children in the orphanage. Here, one kangkong leaf is equivalent to five kangkong leaves we normally see in the market – it’s really huge. 8. 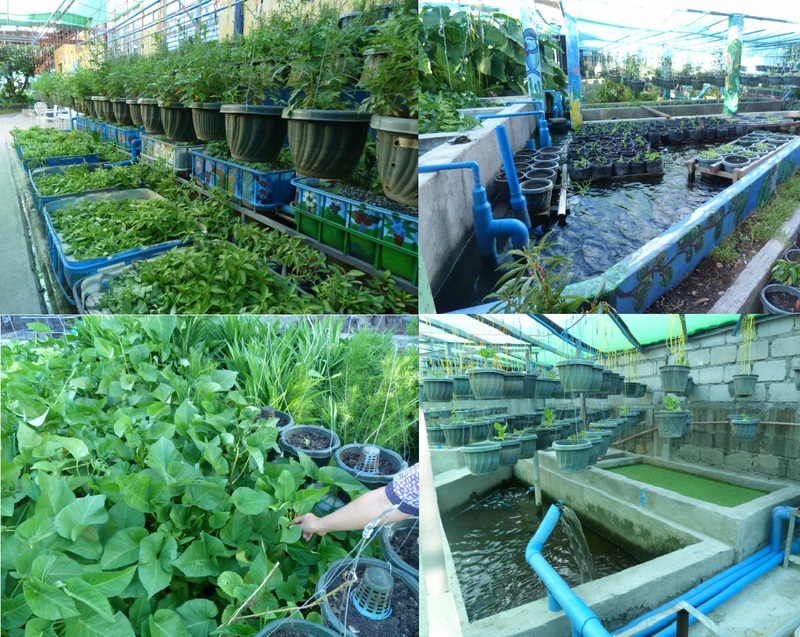 Aquaponics in Bicol. Test setup by Atty. Rael Bitara and friends in preparation for a bigger aquaponics dream in the future. You will fall in love when you see one potential site for their aquaponic system near Mt. Isarog. Hope to see aquaponics agri-tourism in that mystical place in the future. 9. 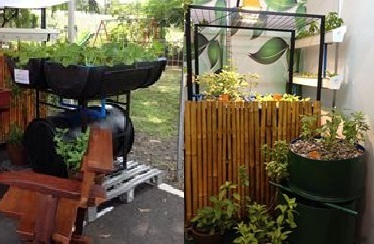 Aquaponics in Laguna by aquaponics hobbyist Nikko Benitez. Interestingly, he was able to build his first bell siphon and make it work with no hassles. He planted basil and amazed by its growth. 10. Aquaponics in Pasig from Modular Aquaponics founders Engr. Martin De Leon and Erwin Leonor. Earlier this year we visited their place and got a chance to see their system that grows lettuce, okra and tanglad among others. They also grow duckweed and azolla for feeding to the tilapia. 11. 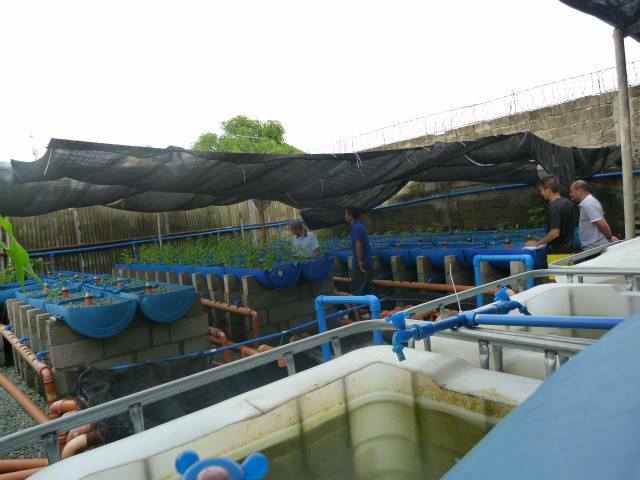 Aquaponics in Taytay, Rizal by Pinoy Urban Farmer founder Dino Juan. 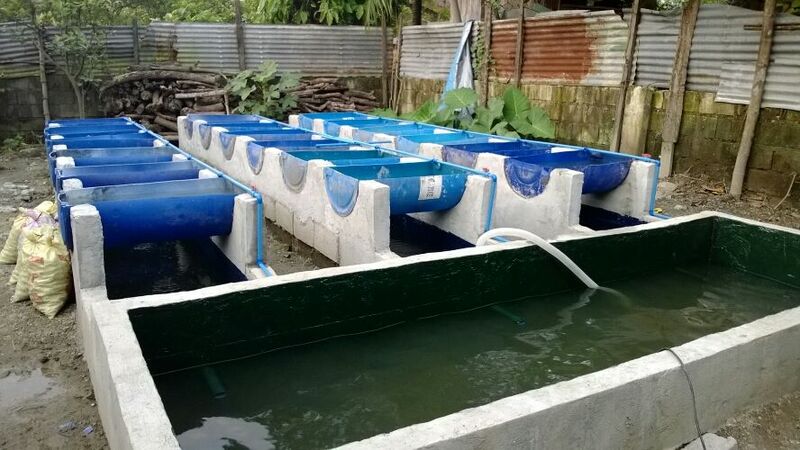 From an enterprising family who’s into aquaculture and other businesses, he thought of introducing several aquaponics system design in the Philippine market that would require small spaces fit for urban farmers. 12. Aquaponics in Bantayan, Cebu has “Para Sa Aton” (For Us). Project overlook by Martha Atienza, Jake Atienza, Angelicum Oda with Aquaponics Bantayan team – Cloyd Anthony Ribo, Ging Alano, Lucille Alano. This is an art project that uses media campaign to tackle economic, social and environmental issues. 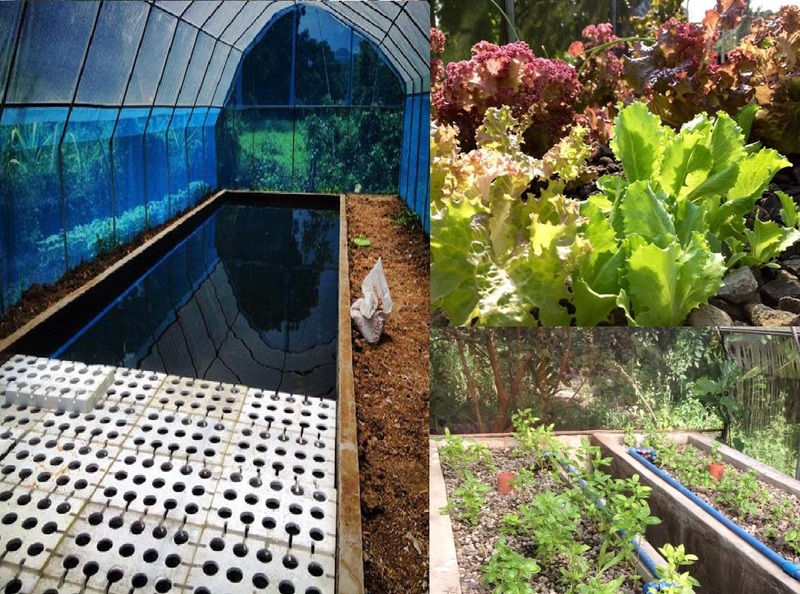 Part of “Para Sa Aton” project is Community Aquaponics System(CAS) that is implemented alongside initiatives that provides common ground for the community to collaborate, exchange ideas, and participate through arts and culture, community dialogue and livelihood. As aquaponics goes mainstream in the Philippines, we are very optimistic that the risks brought by climate change, food security, radiation leak, over fishing of marine life and rising fuel cost used to produce and transport foods to the consumers will be mitigated with this technology. Aside from the access to fresh fish and vegetables, when we learn the symbiotic relationships of plants, fish and bacteria through an aquaponics ecosystem, also inculcated in the minds is awareness that all living things on earth are interconnected. Hopefully it spurs collaboration among our people to protect the environment for the next generations to still enjoy biodiversity in the Philippines. As the saying goes “we do not inherit the lands from our ancestors, we just borrowed it from our children” and what we leave behind for the next generations is a living and breathing planet with all the beauty of nature that we see exist in our lifetime. 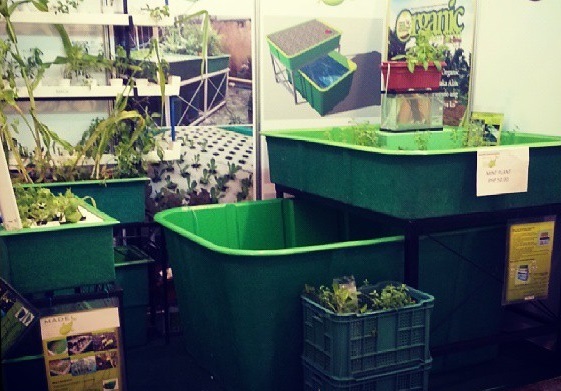 So far, we have not yet come across any commercial aquaponics in the Philippines. If you want to share your commercial aquaponics success story in the Philippines please e-mail apphil@ymail.com, we would love to hear from you.